You are here: Home / Taxpayers / U.S. Tax Court Win! A win in U.S. Tax Court saves an elderly client from an erroneous IRS assessment. Let me set the stage. I was hired by the taxpayer’s son to represent her regarding an IRS notice assessing her with $3,000 in self-employment taxes. People get assessments all the time but in this case the client was an elderly lady. In a nursing home. Suffering from dementia. It is hard to see how the IRS believed that this poor lady was liable for taxes related to self-employment. It turns out that the taxpayer during her life built up a collection of valuable jewelry and collectible coins. Concerned about possible theft of these valuables while in the nursing home, her son moved it to a safe deposit box at a local bank. Despite his best efforts, however, the bank allowed someone else in the family to get into the box and remove valuables. Rightfully upset, my client’s son hired an attorney and threatened to sue. Ultimately the bank settled for $25,000 but the problem arose when the bank issued a 1099-miscellaneous which treated the payment as non-employee compensation meaning it was paid for work performed rather than paid as a settlement. The client’s tax return was prepared which reflected the $25,000 settlement but did not show that it was subject to self-employment tax. The IRS picked up on that and send the client a letter stating she owed additional taxes on the settlement. The son tried to explain the situation by sending numerous letters explaining the settlement and the state of his mother’s health. The IRS refused to budge on the issue. Eventually the IRS issued the client a notice stating that she had 90 days to challenge the IRS assessment otherwise she would be liable for the additional taxes. At this point, I became involved in the case. I filed a petition in U.S. Tax Court to stop collections and to get this resolved. No one likes going to court and understandably the client’s son was worried about his mother being hailed into court but U.S. Tax Court is different. Once a case is docketed with U.S. Tax Court, the client is set up with an IRS appeals hearing to settle the matter. In effect, the client had another bite at the apple with the IRS. Before the hearing the taxpayer is given a chance to provide any information relevant to the case. I took this opportunity to provide not only a statement from a doctor about the taxpayer’s dementia but also extensive documentation about the settlement payment. We never had the hearing. I was notified within a couple of weeks that the IRS agreed with my client and no tax due. A huge relief for my client’s son as all his mother’s money was spent on her care and she could ill afford paying $3,000 in taxes plus interest and penalties. My firm helps Maine taxpayers in trouble. If you or someone you know in the Greater Portland, Maine area wants more information on how to contest an IRS assessment, please feel free to contact me directly at 207-299-0515 or by filling out my contact form. A Maine tax attorney can help you consider your options. 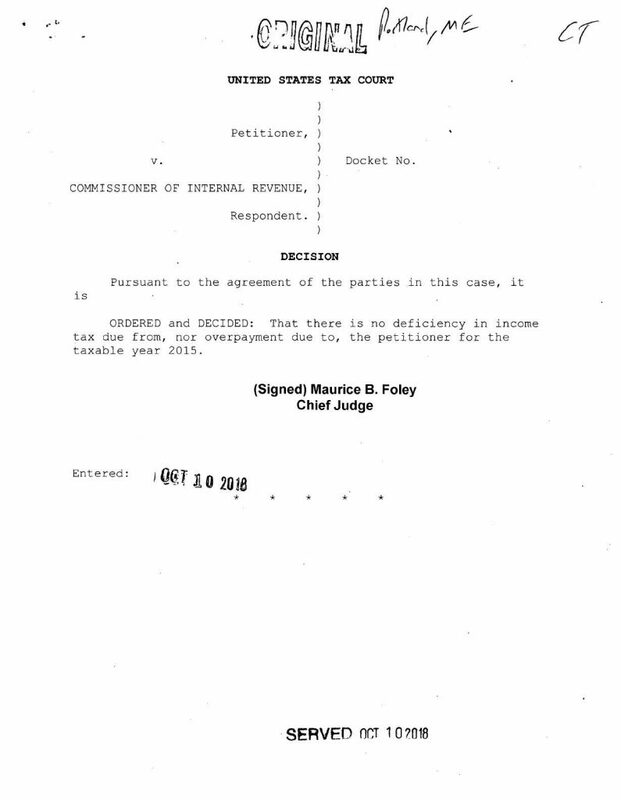 Here is a copy of the U.S. Tax Court’s decision entering judgment for my client.